I need to go grocery shopping. In a bad bad way. Tonight, I just experimented a bit with what I had on hand and created this recipe. Nothing sparks creativity like necessity, right? 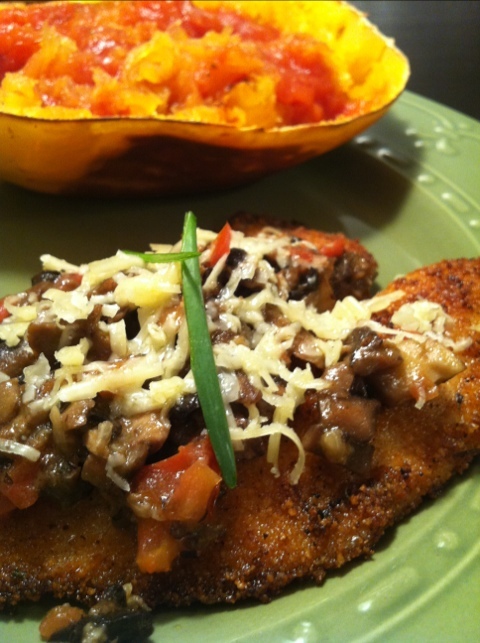 Using small tilapia filets dipped in melted butter, breaded with gluten free bread crumbs and seasonings, and topped with sautéed chopped mushrooms, this was relatively easy to throw together for dinner tonight. It was also delicious, so I am sharing. *NOTE: if you don’t like tilapia, sub another fish. If you don’t like fish, try thinly pounded chicken cutlets. 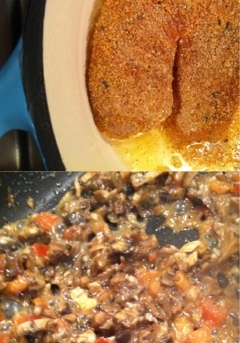 Fish, seasonings and GF bread crumbs, mushrooms with tomato and cheese, and the breaded fish. Combine seasonings with GF bread crumbs. 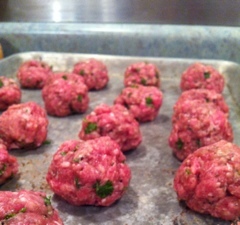 Dip the filets in the melted butter, and then coat them with the seasoned bread crumb mix. In a heavy-bottomed skillet, heat two tablespoons of oil over medium-high heat. When hot, gently place fish in the skillet. Fry for a few minutes and then carefully flip filets over to cook for a few more minutes on the other side. The coating should nicely brown up. Meanwhile, over medium heat in another skillet add chopped mushrooms, chopped tomato, and butter. Cook, stirring occasionally. Remove fish from pan and let rest on a plate. 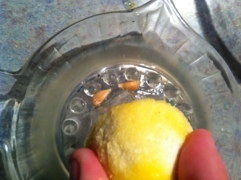 Add two cloves of minced garlic to the mushrooms, along with a pinch of salt. Cook for a few minutes, until the garlic is nice and fragrant. Spoon the mushroom mixture atop the fish, and then add some of the shredded cheese. Serve with sides of your choice. I served it with some baked spaghetti squash and sauce. 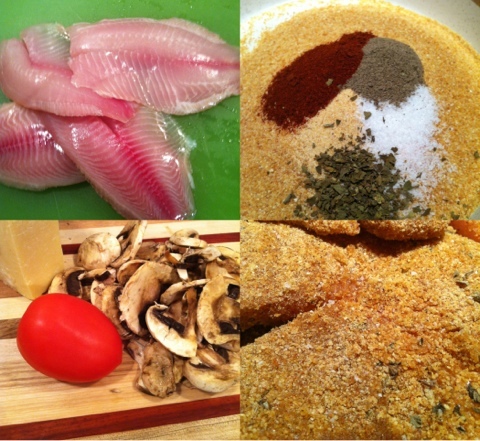 Posted in main courses and tagged fish, food, GF, gluten free, recipe, tilapia. Bookmark the permalink. Well. There actually was a hitch…but it was the happy kind. I’ve had my hands full lately! One of my husband’s employees was planning a wedding. He and his bride-to-be wanted a small personal ceremony. The date was set, rings and license purchased and all of that. Unfortunately, the wedding location fell through, and so I volunteered the use of our home. The wedding was in three days. Due to my control freak tendencies, I made a master list of all I needed to have done and I actually got almost all of it finished. I also had fun doing it, I kid you not. I got it done! Including but not limited to, scrubbing the entire place ceiling to baseboards, redecorating, moving furniture, and creating an hors d’ouvres spread to feed 20+ people. There were a few hair-pulling moments (like when the fridge went kaput the morning of the wedding) but overall, it went great. I won’t bore you with the mundane tasks and details now; let’s get right down to the food. 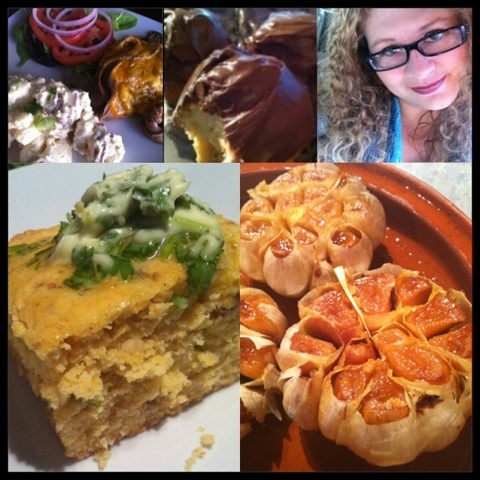 My goal for the menu was to create a variety of foods that were delicious little bites, and quietly gluten-free. I wanted guests to look at the line of foods and see good food, not “gluten free” foods. From the raves and compliments, I am pretty confident that I succeeded. 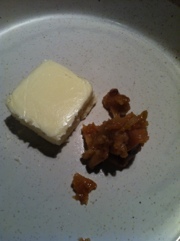 I also served spiced almonds and hard candies as well. Mix all ingredients together. Roll into small balls. You should get around 70 of them. Bake for twenty minutes at 375. Then, place meatballs into a slow cooker. Mix and pour over meatballs in the slow cooker. At this point you can refrigerate them overnight if you want. To finish: turn the slow cooker on and keep them on low for 6-8 hours, throughout the party. 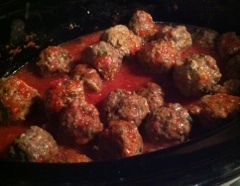 The sauce will thicken slightly and soak into the meatballs. These disappeared quickly. 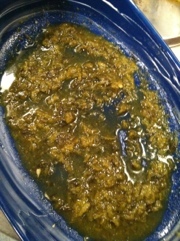 Warm butter and garlic in a saucepan over medium until butter melts. 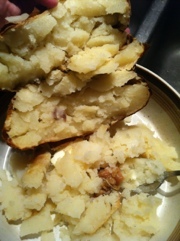 Open the potatoes and scrape the potato from the skins. Mash completely, adding salt and pepper. Then stir in the parmigiano-reggiano cheese. 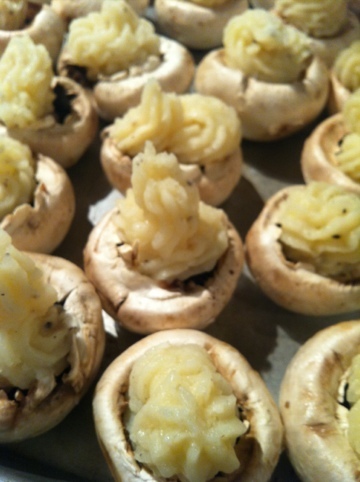 Pipe the potato mixture into the mushrooms. Bake at 375 for about 30 minutes. 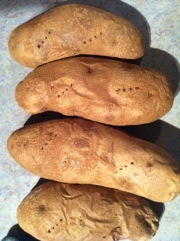 See photo at top of post for how they appeared going into the oven. I apologize for the lack of photos of the other foods – they all looked perfect enough to photograph beautifully, too! Things just got so crazy that I completely forgot to take photos, until it was almost over. By then, most of the food had disappeared (which was a good sign, I think!). Plus, I was asked at the last minute to stand up with the couple, which was an honor I treasured – even though it caused all thoughts of my little food blog to fly out of my head. The other items on my menu are, I believe, pretty self-explanatory. Except perhaps for the guacamole – but as penance I suppose that I will submit myself once again to the task of making some fresh guac soon (like I need an excuse), and I will take detailed pics of the process like I normally do. Deal? It was a fantastic evening, and I was thrilled to see everyone enjoying the food I’d made. Which is kind of the point, yes? All in all, the whole experience was unforgettable; I feel so privileged to have been a part of the beautiful beginnings of this couple’s life together. Posted in appetizers and tagged appetizers, buffet style food, GF, gluten free, hors d'ouvres, party foods, wedding food. Bookmark the permalink. My family loves these, and they’re relatively quick and easy to create. 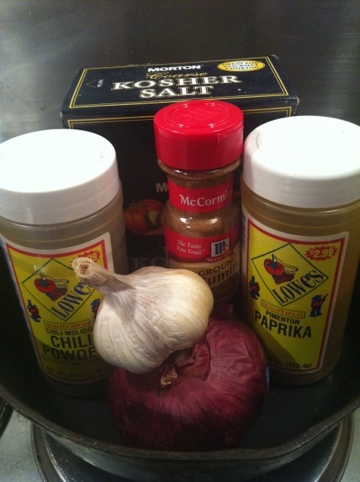 I use shortcuts – such as, I start with some already-cooked rotisserie chicken and my green chile sauce. Preheat your oven to 350. 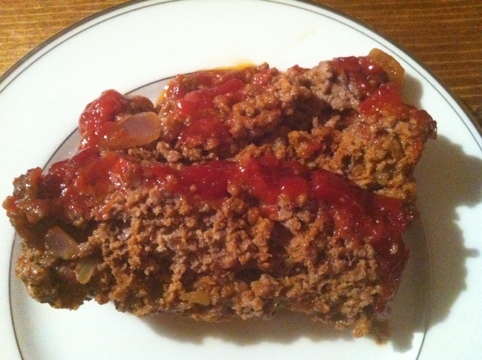 Start by spreading about 1/3 cup of the sauce into a prepared baking dish. Mix 1/2 cup of the sauce into the cooked chicken pieces. 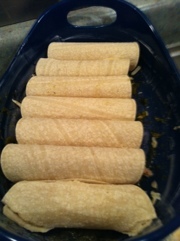 Warm the corn tortillas by wrapping them in a damp paper towel and microwaving for a few seconds. They should roll much easier. 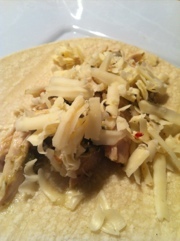 Top each tortilla with the chicken mixture and some cheese. 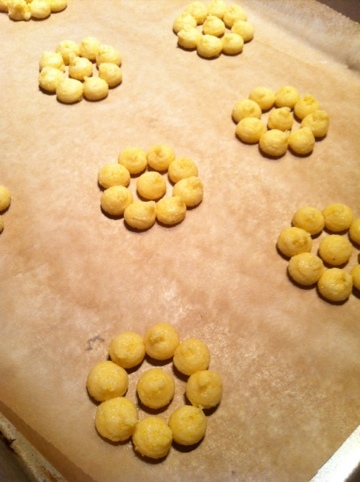 Roll them and gently place them in the prepared dish. Follow with the other seven until you have all eight of them in the dish. 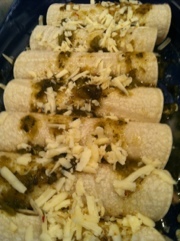 Top with the remaining green chile sauce and cheese. Then, pour the melted velveeta over the enchiladas, covering all of the tortillas. Bake at 350 for 20 minutes. Serve. Note: My husband is a major Velveeta addict so that’s what I used – but it would be delicious with a blend of cheddar and jack cheeses as well, just add extra sauce to cover the tortillas. 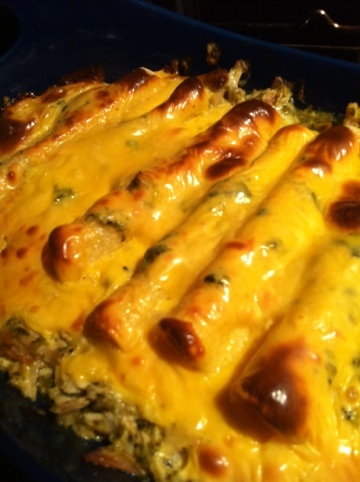 Posted in main courses and tagged cheese, chicken, corn tortillas, enchiladas, GF, gluten free, green chiles. Bookmark the permalink. On December 12, it will have been an entire month of going gluten-free. What I’ve noticed: in general, I feel much better overall. My energy levels seem to be nudging up. This is excellent. My joint pain has become virtually non-existent. The auto-immune issue I had been having with my eyes (specifically, my tear ducts) has all but disappeared. The exceptions to the rule: I messed up, as well. I had a beer or two (this was before I’d happened upon the fact that GF beer exists, yay!) one evening, and the next morning I woke absolutely ill. I felt like I had months ago. Pain. Aches. Headache. The inability to think very clear. Also, my sinuses were so inflamed that my whole face ached. I thought it may have been due to the gluten, but it may have also been due to the beer itself. So, not long after, I had a cheeseburger at a fast food place. The results were almost identical. Except this time, I had stomach pain as well thrown in there. Maybe it’s the gluten. It appears that way. Maybe it’s just a coincidence. I don’t know. But it was miserable enough to cement my desire to only consume gluten-free products. I simply feel much better without gluten. It saddens me to admit this, honestly. I had secretly been hoping that the GF diet would do nothing and that consuming gluten wouldn’t affect me negatively. I didn’t realize that it could affect me so severely after just a few weeks of being gluten-free. It also helps me to realize that all of my life I’ve consumed gluten at virtually every meal…but it was only relatively recently that I’ve started experiencing noticeable unexplained health issues. Going gluten-free for a few weeks makes it really seem like I’m onto something here, with regards to my health. I also never imagined that I’d be one of those people. You know. The ones who are picky about what they eat, how it’s prepared, and what comes into contact with it. But here I am. On a side note. 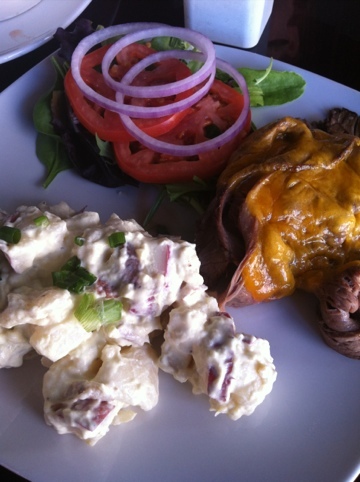 A friend and I have been researching the Paleo diet and Primal Blueprint diet. I find it highly intriguing, and plan to incorporate more of it into my eating plan. To review: last month I started the gluten-free diet, started a facebook page, had a bit of a week one meltdown, posted a cornbread recipe that got published in a local newspaper, still haven’t figured out my twitter account, tried my first gluten-free beer, got some great recommendations from a fellow blogger (thanks, Mr PC! ), found a neat restaurant, and started looking into Paleo. Quite a month, if I do say so myself! I’ve learned a lot! This last year in particular has been very rough for me, health-wise. I’m looking forward to trying out more things that may help me. It’s becoming apparent that gluten-free is the new way of life for me. I’m glad I have done it. Month One was, all in all, a resounding success in my book. Posted in reflections and tagged GF, gluten free, Paleo, primal. Bookmark the permalink. So, a friend and I found ourselves in downtown Oklahoma City today. We were trying to find a decent place for a quick lunch. So, as Holly deftly navigated through the traffic, ridiculous construction, past idiotic drivers, and down one-way Bricktown streets (the right way, I might add), I browsed Urban Spoon for a good place for a gluten-free meal. I found one that looked promising, and upon further inspection I was impressed with the menu and the apparent awareness of gluten-free fare. So, we tried it. Located in the Deep Deuce historic jazz neighborhood just north of Bricktown, it was relatively easy to find. The waitress was familiar with gluten-free items and didn’t look at me like I was requesting anything unusual for wanting a gluten-free meal. During dining, we learned that the location had only been open a couple weeks. The ingredients were very fresh, the dishes were nicely prepared, and the presentation was eye-pleasing. Next time, I want to try the salt bar. I’m intrigued. Check out their menu! You can find their info and menus at www.sageokc.com. Posted in Reviews: on the road and tagged Bricktown, dining out, GF, gluten free, OKC, on the road, Restaurants, Sage Gourmet Cafe & Market. Bookmark the permalink. 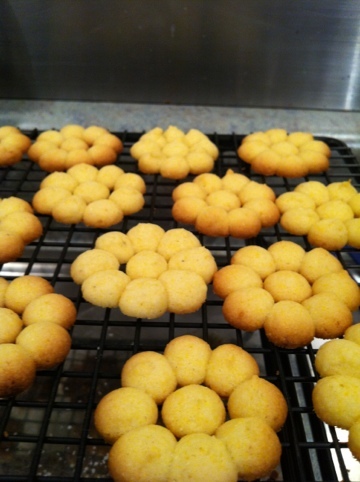 I found a recipe for these cookies years and years ago, and converted it to a gluten-free recipe. They are very easy to bake, and quite delicious! You can find the original recipe here. 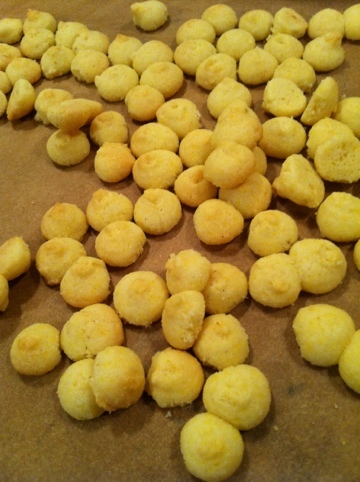 They’re delicate, with a hint of lemon and a crunch with the cornmeal. They’re pretty simple to make, but look and taste impressive! Blend until light and fluffy-looking. 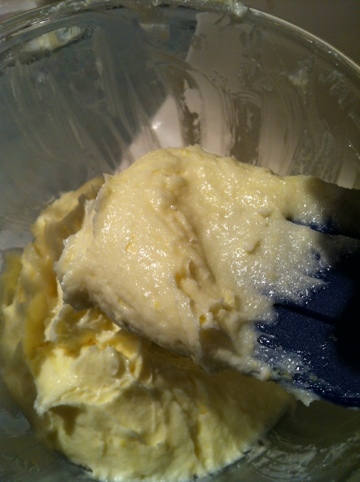 Then, I realized that I need to switch to a bigger mixing bowl….Oops. 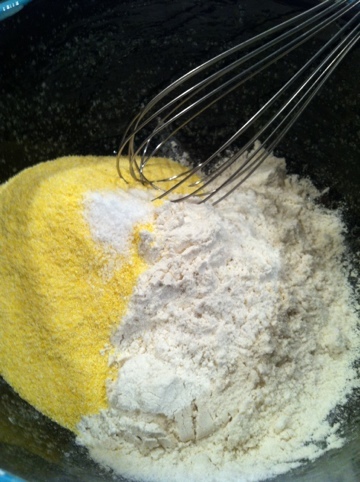 Commence adding in the flour mix to the butter mix and blend slowly. 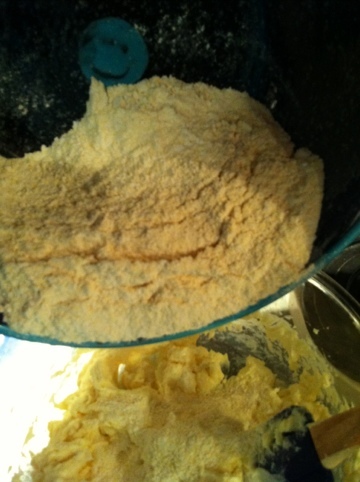 I added half of the flour, blended, then added the rest. Bake for about ten minutes for the small cookies, longer if you are doing larger cookies. The edges should start to brown a bit. Preheat the oven to 350. 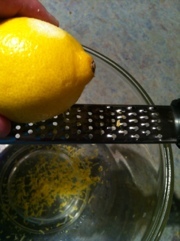 Zest the lemon- you should get about a tablespoon of zest – and then juice it. The recipe only uses 1/2 tablespoon juice, so you can reserve the rest of the juice for another use. Whisk together the flour, cornmeal, and salt. Set aside. 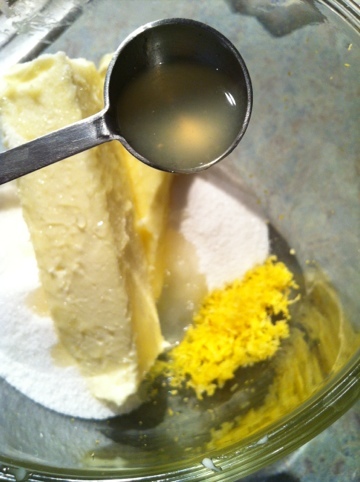 Mix in mixer the butter, sugar, lemon zest and juice until pale and fluffy. Add in eggs, blend, and then add in the vanilla. Add dough to cookie press, and press out cookies onto parchment-lined baking sheets. I used the flower design. Bake at 350 for ten minutes. Allow to cool a few minutes, then transfer to a cooling rack. 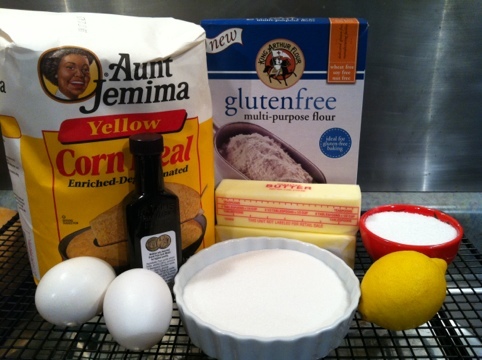 Posted in desserts and tagged cookie press, cornmeal, GF, gluten free, glutenfree, lemon. Bookmark the permalink.